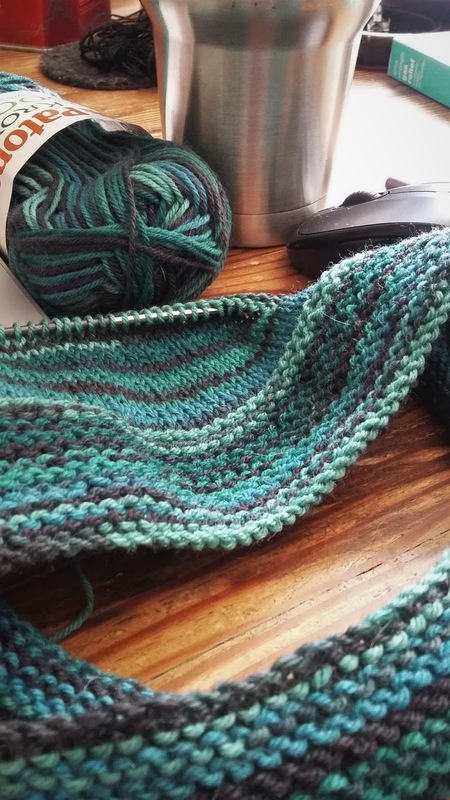 So, in setting goals/making plans for the Jeannie Gray Knits section of my 2018 life, I decided I was going to shift my main focus onto my blog and away from my Etsy shop. Knitting for the two places can get tricky. There are only so many knitting hours in the day and while the Etsy shop wants the same five or six hat designs knit over and over again, that is the last thing the blog wants to see. The blog wants new and different things, just about daily. So, the goal was to sort of let the Etsy shop flounder. Except one of my goals was also to restock the Etsy shop. My 2018 goals were turning out to be as confusing and opposing as my dream of living in a beach house on tidal water... in the woods on top of a mountain. Well, along came Maggie at Not a Station. Maggie wrote about challenging herself to knit 52 hats in 2018. Sounds like fun, right? Challenging, but totally doable! And so an idea was born. I'm going to also knit 52 hats in 2018. Some hats will be my own designs for the Etsy shop and some will be purchased patterns that the blog wants to see. And even better, hats are an excellent way of knitting up stashed yarns. Which is a whole other goal for 2018. And all those hats knit from paid-for designs can get donated to a charity. (Donated because I just don't feel right about knitting someone else's design and then selling it.) So, another win for the 52 hats idea! And here it is, week four of 2018 and there is hat #4 on the needles! I'm reading In a Cottage in a Wood by Cass Green and absolutely loving it! I'm almost three quarters of the way through the book and I'm still not sure if there's a bad guy, something supernatural going on, or if the main character is simply loosing her mind. I have the feeling that I won't be getting much knitting done until I find out. Join me over at As Kat Knits for today's #Unraveled link-up. I hope you can do both the blog and the Etsy! That would be the idyllic solution. I find myself swamped with blog, knitting, babysitting, gym and then think but wait, I'm happy with the way things are. A great challenge! I could start that and already be knit up to March since I was hat crazy at the start of 2018! But then, preemie hats allow you to get quick and easy hats done in no time. Hmm, maybe that should be a side challenge for me. 1 preemie hat a week is totally doable. Good luck! We're also in the same boat about what to do with them all. I hope to sell some in a consignment shop next winter (Etsy is hard to keep up with when you're travelling a lot), let my family have a few and the rest will be packed up for South-Africa. 52 hats! I'm impressed! I'm good for 1-2 hats per year and that's it! Wow! That's an impressive solution. MORE HATS!!!! I love the 52 hats idea! Brilliant! I look forward to seeing them fill up your 2018! That's a LOT of hats. I look forward to seeing all the interesting patterns.